Save Time and Resources. Start by going after the RIGHT retailers. attracts young and trendy customers. Devising a retail attraction strategy is a bit like threading a needle. Getting the thread through the needle requires a keen eye for details or you will miss your mark entirely – and end up a bit frustrated to boot! In this post we make the case that diagnosis, analysis and market data are critical to ensuring you spend time chasing the right tenants, not the wrong ones. But knowing what kind of tenants to pursue is just one piece of the puzzle for commercial district managers, the other is getting buy-in from local stakeholders, including BID Board members, property owners and brokers, that your recommendations are sound and market-based. Having the right data and presenting it well is part of what it means to have an effective retail attraction strategy. Basically, when you know what kind of district you are, or can be, and you have the facts to back you up, you can be much more successful in selling your vision and attracting new retailers. 1. Know what retail categories you can support and would make a good addition to your district. At its most basic, this involves looking at your market and retail leakage data and talking to your existing retailers. 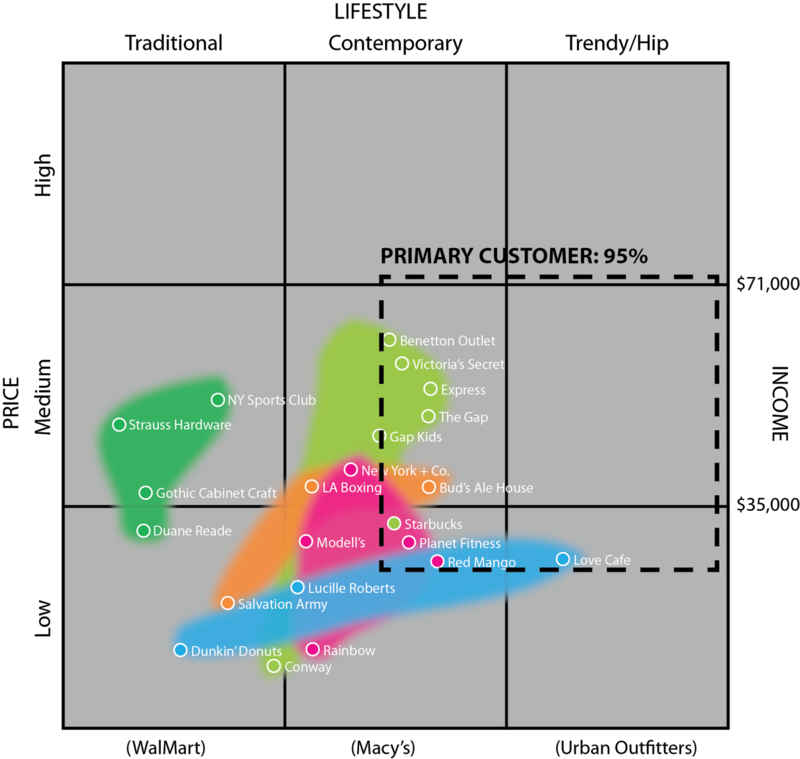 A more sophisticated analysis would involve focus groups and maybe even customer surveys. Surveys are useful when you have a lot of non-local resident customers (mostly because Census Data won’t tell you much about their consumer preferences). 2. Know what price point is right for your market. Are you a high-end or value-oriented district? Missing the mark on price point can be the death knell for a local business. For example, we are working in one community that needs an electronics store – and a few years ago they got one. But it was a little too high-end for the local community and the store owner did not do much to change the merchandise mix and price point to reflect his customer base. Within a year, the store was closed and the owner in debt. Now, understandably, other electronic stores are hesitant about the market. This is the worst possible scenario, because while the market CAN support the right retailer they will all be hesitant because of the failure of one retailer who shouldn’t have been there to begin with. 3. Know your district’s “lifestyle segment”. In the retail industry, retailers are categorized by “lifestyle”. While the industry terms vary slightly depending on who you ask, generally lifestyle falls into three fairly self-explanatory categories, “conservative”, “contemporary” or “trendy”. Take a moment and think about the retailers you know and love. Where do they fall on the spectrum? Conservative retailers will sell you the basics, won’t try to rock the boat with far out advertising or styles that will change drastically from season to season. People from many walks of life and many backgrounds may shop at this kind of retailer. On the other hand, contemporary retailers try to keep on trend, but within reason. Think Macy’s or Banana Republic. Trendy retailers are a bit more avante-guarde and appeal to a smaller segment of the population. Think Brooklyn Industries or American Apparel. They typically need a larger trade area to survive, because they are pulling fewer customers from the general population and therefore need to attract people from a larger geographic area. To communicate how all of these data points overlap, we created a proprietary matrix called the LOA Strategic Positioning Matrix (TM). This deceptively simple chart has evolved slowly over time and is based partially on the work of veteran retail consultant John C. Williams (“Getting Retail Right”), the author of some excellent books on retail that are must reads for practitioners in the field. In any case, in the past we often struggled with communicating succinctly how market data and retail opportunities overlapped until we developed this tool. Now, the more we use this the more it has become one of the most useful tools in our arsenal! In any case, by taking William’s framework for retail to another level, we have been able to more effectively describe a district and its customers to stakeholders, property owners, brokers, etc for the purposes of finding the most viable tenants. In the next few images, I will share with you how we use this tool with our clients to help them refine their retail attraction efforts so that they target only those tenants that will help round out and improve overall retail mix. This strategy helps save communities from chasing tenants who are the wrong fit and conserves valuable human and capital resources. The level of detail encapsulated in the LOA Matrix ensures that the retail attraction strategies we offer are extremely customized and reflective of the unique conditions of any given neighborhood. We’ve also found that the matrix can be very useful in dealing with key local stakeholders. Stakeholders can sometimes misjudge their district (surprise, surprise!). For example, they may think that the district is in a position to attract a much higher-end retailer than the market can truly support. This tool can help you quickly manage expectations and keep everyone on the same page as retail recruitment begins in earnest. Here are of our recent projects that demonstrate how we use this tool. Our analysis revealed the need to bring tenant mix in line with a rapidly changing demographic. Steinway Street merchants may have been the right mix for the neighborhood in the 1990’s, but today the tenant mix is somewhat outdated. Younger, mobile professionals are moving in – and are spending their dollars elsewhere. Addressing these issues and meeting the needs of this growing population will be critical to ensuring that Steinway Street businesses are effective and successful. So how did we communicate this to stakeholders? 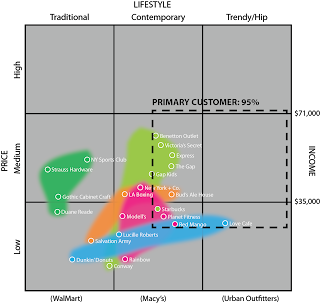 We first mapped retailers according to two criteria, price point and lifestyle. The vertical axis maps Price Point, while the horizontal axis maps Lifestyle. Every existing and potential tenant can be mapped on the Matrix. For Steinway, an extremely long corridor with a number of divergent identities, we did a block by block analysis to discern significant differences between blocks. In the Matrix below, each color blob represents a block along the street. As you can see, some blocks offer a mix that is solidly contemporary and mid-priced., including the strongest block on the street that includes a number of national popular priced chains such as The Gap, Express and Victoria’s Secret. Other blocks are much more varied in offerings, lacking a clear identity for shoppers. For the most part, the offerings on the street are low to moderate in price and decidedly traditional and contemporary. 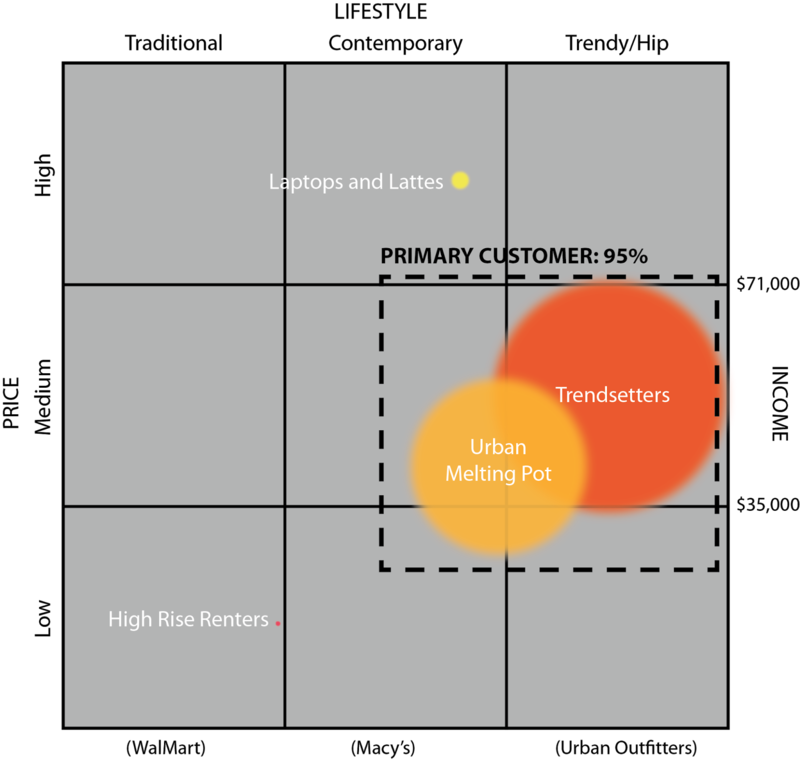 We then analyzed the district’s psychographic data and found that 95% of the market fell into two categories, “trendsetters” and “urban melting pot”. ESRI defines each of these as follows: Trendsetters are young, diverse and mobile. They are spenders. Fashion-conscious, they shop at stores like Banana Republic, Gap, Nordstrom and Macy’s. They buy organic food, exercise regularly and own the latest electronics. Urban Melting Pot neighborhoods are ethnically diverse, made up of over 50% foreign-born residents. Fashion conscious, yet cost conscious, Urban Melting Pot residents love to shop. Macy’s is a favorite but they also shop at other upscale retailers, as well as warehouse/club stores, especially for clothes and jewelry. 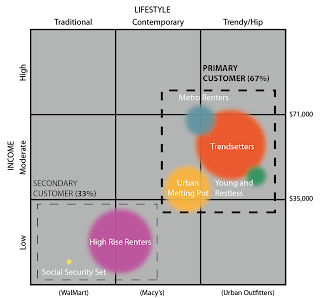 When we mapped these lifestyle segments, taking into account the median income of each segment and their various characteristics, what jumped out at us immediately was the significant mismatch between the merchandise mix and the residential market. This data confirmed what many stakeholders – and a consumer survey – had told us, that Steinway Street was inadequately serving the local market. Not only was the tenant mix stale and in need of fresh retail offerings, but the current mix was actually undermining the success of street. In seeking new retailers, we clearly outlined a strategy for our client that included a focus on retailers whose price point was moderate (not cheap) and offerings that were a mix of contemporary and trendy (not conservative). As part of our exercise, we also scanned the local market and used our own growing list of New York based regional businesses to suggest over a dozen retailers that fit this profile and were located in similar urban markets. Moving forward, the low vacancy on the street will require significant partnership with property owners to help them understand the importance of retail mix and to ensure that they fill spaces with appropriate retailers as vacancies come up. Grand Street is a very different animal. What we found after mapping the residents in the community is that there are two kinds of customers with very different needs and expectations. The first is a low-income resident who resides in public housing. The second is a young artist or professional – again back to that “trendsetter” lifestyle segment. These two customers have some overlapping needs but not not many, making it challenging for retailers to meet this set of divergent expectations. Our stakeholder interviews also bore this out. Some retailers reported struggling to meet the needs of both kinds of customers and were nervous about cultivating a higher end look or merchandise offering for fear of losing their core customer base. Another interesting element to this analysis was spatial. When we looked at a map of the district, it was clear that one end of the street met the “high rise renter” needs, while the other end of the street meets the “trendsetter” needs. Of course, our retail recommendations included a block by block strategy that recognized the distinct differences in these customers and the desire of certain retailers to locate on certain blocks on the street. We are excited to share this with our followers and would love feedback and thoughts! This tool is very much a work in progress – but we hope you enjoy the thinking behind it!! We're a BID looking to rework the retail mix on our 100 year old main street in Mt. Airy, Phila. Our corridor is also long and has dead spots (with nursing homes and parks blocking the retail environment). And we also move from higher income at one end, to lower at the other 2 miles away. We're wondering what it costs to get an analysis done, so we can create a realistic plan for reporting first to the BID, and then to the other stakeholders.